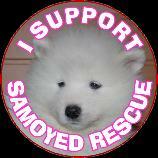 We have a limited number of Samoyed Rescue Pin badges available in the designs shown above, all proceeds (minus P&P costs) will go directly into the rescue fund. 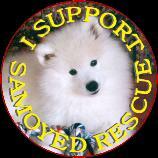 All designs are available for a minimum donation of only £2.25 each including P&P within the UK mainland. 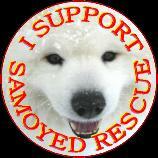 Please donate a minimum of £3 per badge if you are outside the UK. 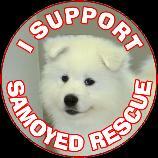 As all proceeds are going to the rescue fund in order to help Samoyeds in need, please feel free to donate as much as you wish over this amount if you feel that you would like to make a larger donation. 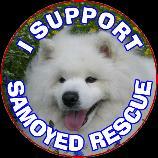 Each badge is 38mm diameter and is a high quality, full colour, tin badge with gloss finish and integral safe pin. 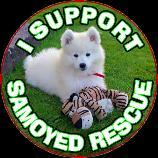 Your badge will be dispatched as soon as possible, but please allow up to 14 days for delivery. 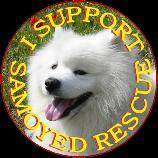 Please note that we reserve the right to send an alternative design if the chosen one is not available. After clicking on the orange donation button below you will be taken to a secure Paypal site which will open in a new window and will be asked to either fill in your credit/debit card details by clicking on the "Don't have a PayPal account?" - continue link or to sign in if you already have an existing Paypal account. 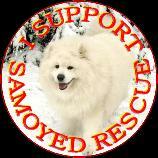 Please note that you do not need a Paypal account to make a donation. It is completely safe and secure to use this service as it is a fully encrypted payment service. On the next page you must click on the link : "Designs & Quantities :" which is in blue to the left of the subtotal. Please be sure to let us know here what designs & quantities you require sent. Please also include your name & address here so that we know where to send them ! 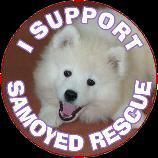 Thank you for Supporting the Samoyed Association Rescue.